The controversy between the artist Blu and the curators of the exhibition in Bologna Street Art – Banksy & Co. opens a conflict without apparent solution. We must start from the concept of ugly to discuss about the urban renewal. That, of course, seems very subjective. Who says something like that? Why someone should give me his art without my asking? Two questions that are at the base of street art and its full implementation. We start from a wall. It will always, or almost always, start from a wall. We start by a falling wall, falling and crumbling. Ugly, maybe. We put color in the hands of an exhibitionistic fighter. And then the wall comes to life. The result amazes, or at least excites curiosity, anyone: urban regeneration. The fighter decides so. Now, who’s this work? His, replying instinctively. Ours, if we are thinking that the chosen location forces us to a continuous vision. Blu and the controversy of Blu’s work fit on the basis of this dichotomy. The known facts: Bologna hostes the exhibition Street Art – Banksy & Co. And to find some works, the organization decides to detach from the walls drawings protagonists of this current. Maximum symbol of this operation is a huge Blu’s graffito, built in 2006,ten meters tall: a reinforced concrete wall detached from the former Officine Casaralta of Bologna, a design weight of 150 pounds. The curators of the exhibition obtained the premission from the owners of the building. And the rest didn’t matter. Who owns this work? He does. We do. 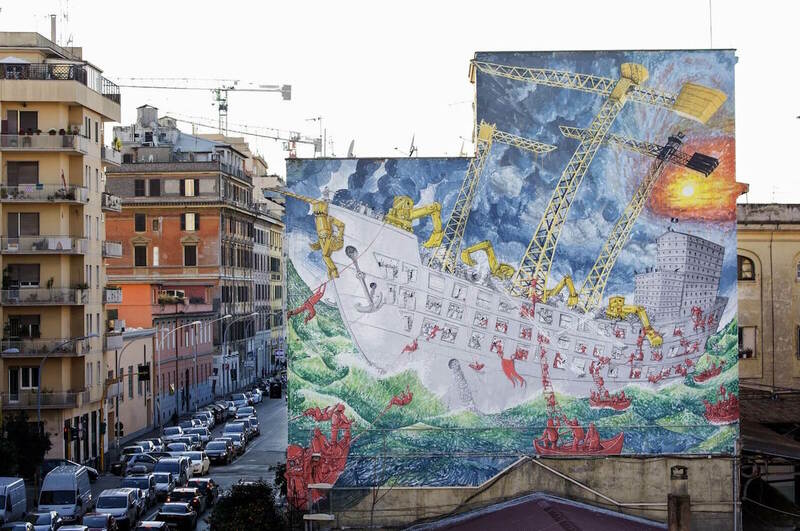 The elusive Bologna’s writer, born in Pesaro, isn’t agree and opts for the most sensational gesture deciding to erase with a gray paint all his works around the city. This isn’t a new operation for Blu that, in Berlin, already eliminated his graffito in Cuvrystrasse, in the Kreuzberg district, to protest against the drift elitist that the area was taking. «When an artwork is done inside or on someone else property – says, to the newspaper Il Fatto Quotidiano, Fabio Roversi Monaco, president of Genus Bononiae City Museum and the motor of the exhibition – the street artist expresses his antagonism but knows perfectly that doesn’t own that space but the space remains property of its owner.» Hard to blame him. «The exhibition” Street Art “is the symbol of a conception of the city that must be fought – Blu responds in a statement given to the collective Wu Ming – based on the private accumulation and transformation of life and creativity of all for the benefit of a few. In front of anarrogance of the landlord, or colonial governor, even of those who feel free to take the drawings from the walls, you just has to make drawings disappear. Acting by subtraction, making impossible the free punic buying». Is his? Is ours? Some of the stripped stables were in demolition. So easy to say that works are literally been saved from certain destruction. 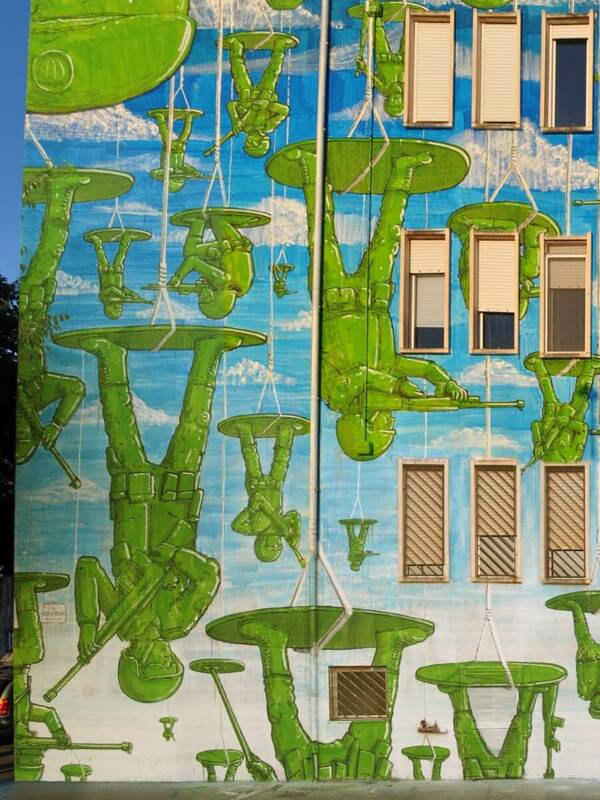 On the other hand the representatives of street art also forsee this possibility for the life of their works. It’s part of the game. Isn’t trivial issue, in a time when this form of artistic expression is output by the size of the simple gesture subversive and entered more fully into the world of ideas to display. It remains an unresolved crux, a contradiction in terms: Who’s this work? Catalog it becomes easy when the author’s signature appears but define the ownership is pretty hard because forks into two directions: intellectual and material. He drawn it so he owns it or we own it because it was drawn on a visible space for all of us?